Candace Payne AKA ‘Chewbacca Mom’ is back and this time she’s got company. Payne became a viral sensation last week after expressing her pure, unadulterated joy for her ‘talking’ Chewbacca mask. Her infectious laughter seemed to capture the hearts and minds of millions, as the video became the most watched Facebook Live video ever, by far. 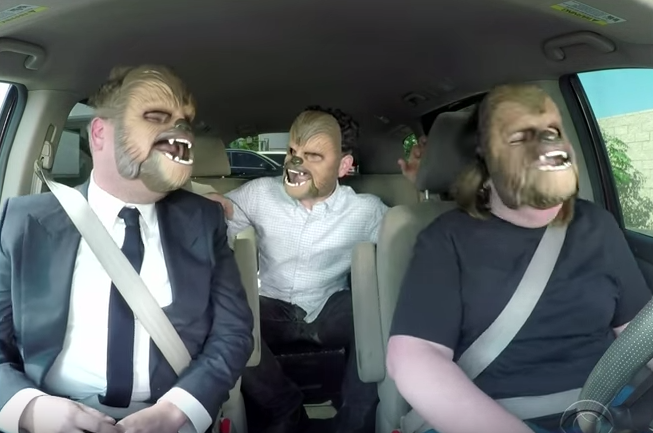 And now, just five days after the video was originally posted, the ‘Chewbacca Mom’ managed to bag a spot on The Late Late Show, appearing alongside James Corden and The Force Awakens director JJ Abrams. Candace was supposed to be driving James to work, but it seems he wasn’t as amused by the gimmick as much as she was- that was until he tried on the mask for himself anyway. She went on to chat with James on The Late Late Show about her new found fame, and even got a message from Chewbacca himself, Peter Mayhew. But that wasn’t all though. They also set aside four VIP tickets for Payne and her family so they can have a private meet and great with Mayhew. Result!